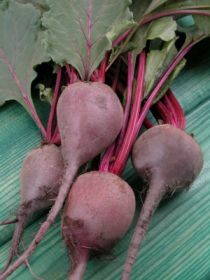 Beets are a highly nutritious root vegetable. In addition to being rich in vitamins and minerals, it contains a phytonutrient called glycine betaine which functions as a “methyl donor” and is important for liver function, cellular replication and detoxification. Boil beets in water until the beets are soft enough to poke a fork into them. Can take 1-2hrs. Drain and cool, then peel the skin off the beets. Be careful as beets are can staining. Skin should peel off easily. Cut the beet into cubes. Enjoy hot or cold as a salad.